How can you be sure when you buy Aboriginal art that it is an authentic piece made by Aboriginal people? Some claim that 90% "Aboriginal-style" art wasn't made by Aboriginal people. Worth of art fraud estimated to take place internationally every year . Percentage of art in Western Australian communities said to be fake . Percentage of investigated art shops found to sell fake Aboriginal art . When you buy Aboriginal art, how can you be sure it is an authentic piece made by Aboriginal people? Often art which is tagged "Aboriginal-style" has been mass-produced by white people or Aboriginal people did not consent to their symbols and patterns being used. Some claim that 90% of what's labelled "Aboriginal-style" actually wasn't made by Aboriginal people. Fake art is made in India, Indonesia and China. There have been attempts to introduce labels to authenticate Aboriginal art to enable buyers to distinguish between what has been produced by Aboriginal people and what has not. More recent attempts to protect Aboriginal art added a chemical fingerprint to the painting. Is this item authentic Aboriginal art? A story. A story, most often related to the Dreaming, should be associated with the artwork. Problem: Not all pieces need a story, e.g. body markings or depictions of country. Some paintings come without a story, deliberately or by accident. The artist is Aboriginal. Problem: There can be a fine line between an Aboriginal artist’s contribution to an artwork. For example, is a didgeridoo that is mass-produced by non-Aboriginal people, but painted by Aboriginal people, an authentic Aboriginal product? There are even greater problems with artwork produced by Aboriginal people of mixed descent who often find themselves having to defend their identity. Authority to use style or symbols. Has the artist the authority from the relevant members of the Aboriginal community to paint in a particular style or using a particular set of motifs or icons? Problem: How can you assert this? Even gallery staff can have difficulties answering this question. Cultural relevance. Does this art come from, and is within the bounds of, traditional Aboriginal culture? It wouldn't be authentic if a mainland Aboriginal artist used the Torres Strait Islander style. Problem: This can be hard to establish. As a layperson it is extremely hard to establish the authenticity of an Aboriginal work of art. Authentic Aboriginal art should credit the ancestral lands the object was produced from or which language group they represent. In the absence of a national label of authenticity your best bet is to contact an arts centre and seek information there. Make sure you visit an Aboriginal-owned and controlled art centre before you decide to buy. Note: Consult an expert when in doubt about a piece of Aboriginal art. Businesses have been taken to court over art classified as 'Aboriginal' when it was not. Be especially mindful before buying from online auction sites. See ACCC v Australian Dreamtime Creations for a sample case. 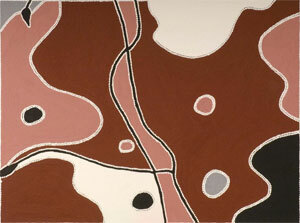 There are often also subtle 'marks of authenticity' embedded in Aboriginal paintings. Many desert art artists paint out in the open where it's dusty. The works of Emily Kame Kngwarreye, from the Utopia community in the Northern Territory, are known to contain hairs of her brushes or little bits of sand from the places where she was painting. Be careful when you buy items marked as 'Authentic Aboriginal Art'. They might not be. In April 2010 Mayvic Pty Ltd, an Australian household goods wholesaler, had to withdraw fridge magnets featuring Aboriginal rock art after the Australian Competition and Consumer Commission (ACCC) raised concerns about its authenticity . The company acknowledged that its conduct was likely to have breached the Trade Practices Act 1974. In October 2018, the Federal Court of Australia found that Queensland-based souvenir wholesaler Birubi Art had misled consumers over its fake Aboriginal art. 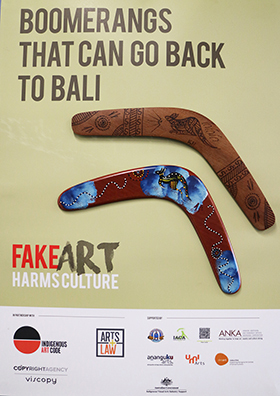 For almost 2.5 years, Birubi sold over 18,000 boomerangs, bullroarers, didgeridoos and message stones to retail outlets around Australia which were made in Indonesia, while the artwork, images and statements used by Birubi suggested that Aboriginal people were involved in the production. Any product, from expensive fine art works to small souvenir items such as fridge magnets, must come with accurate authenticity claims. "I started pulling everything off the bloody rack"
In 1991, the clothing manufacturer Dolina Fashion Group Pty Ltd supplied Grace Bros stores with an 'exclusive' dress design for a major promotion through its network. It was alleged that Dolina's stylists had requested an Aboriginal look from the Japanese fabric maker Sastani to present as the front line of their fashion range. The problem was that the print supplied by the fabric maker was a direct copy of an original work by Aboriginal artist Bronwyn Bancroft, Eternal Eclipse (1998), which had been reproduced illegally. Here's how Bronwyn recalls the case . "It's a funny thing when you're sitting down with a bunch of other Aboriginal people and you're having a cup of tea and someone hears the mailman and goes out and gets the little brochure and brings it in. There's a couple of letters and then there's the Grace Brothers/Myers catalogue. And so I flicked through that. And then all of a sudden I see this really revolting outfit with my painting. Eternal Eclipse, on it! So I raced over to Broadway [shopping centre]… So we actually went over to Grace Brothers and I started pulling everything off the bloody rack. The manager descended and said 'What are you doing?' and I went, 'This is my work, how dare you? '… And I said, 'I demand to see your Manager. I want to know who supplied this. I demand they be taken out of this shop immediately.'" Bronwyn's case was settled out of court and – among others – motivated the development of the National Indigenous Arts Advocacy Association's (NIAAA) Label of Authenticity. One of the 'brightest stars' in Aboriginal art, Sakshi Anmatyerre, whose buyers included the Sultan of Brunei, the Brisbane Broncos, Paul Hogan and the family of media tycoon Kerry Packer, turned out to be an Indian artist named Farley French . Authentication label proposed by the NIAAA in 1999. In late 1999 the National Indigenous Arts Advocacy Association (NIAAA) tried to introduce an authentication label aimed at promoting genuine products and deterring fraud in the Indigenous arts and crafts industry. The idea was to finance the NIAAA by charging fees for applications and labels. However, by 2001, the protocol was decommissioned due to mismanagement and lack of funds. 2006 saw a Product Authenticity Forum in another attempt to protect the significant Australian export industry of Indigenous art. Research has shown that the $700 million tourism gift market prefers functional gifts that tell a story and are Australian-made. But to date the market is without a label that provides security. The world's first chemically protected artwork: Wunubi Spring by Kimberly artist Freddie Timms. "Make me feel better, you know, with that chemical," Mr Timms said . In an attempt to introduce a secure mechanism to identify original Aboriginal paintings a secret chemical code has been painted into an Aboriginal art work to outwit forgers who prey on Indigenous artists. In the process chemical 'fingerprints' are mixed into each ochre that an artist uses to create their painting. The world's first chemically protected Indigenous artwork is Kimberley artist Freddie Timms' "Wunubi Spring" which he created in September 2008. The combination of all fingerprints is unique and helps experts identify the painting. The chemical fingerprint cannot be entirely removed or seen with the naked eye. It can also be applied to existing paintings or their canvas. The chemical technique was created by Rachel Green, a forensic science researcher at the University of Western Australia. "Five different colours have been encoded differently, so they're quite chemically unique," Ms Green said. "They can't be reproduced." The new technique is hoped to help identify art works which are produced in Europe, imported into Australia and then taken into Aboriginal communities where artists paint some parts of them to claim them as their own . In 2007 the Ceduna Aboriginal Arts and Cultural Centre became the first Aboriginal arts centre in South Australia to authenticate an Aboriginal artwork with new technology designed to safeguard art against counterfeiters and thieves . Once the artwork has been tagged the details are saved and fed into a catalogue of Aboriginal art throughout Australia. The system is called IDENTEart and authenticates an artwork with a microdot tag provided by Aboriginal-owned company Datadot DNA. A label of authenticity serves not only the buyer to know that Aboriginal people have crafted this art, it also serves the Indigenous peoples. For Aboriginal and Torres Strait Islanders the symbols and motifs used in their designs also hold cultural significance for a particular group. Exploitation of the design impacts not only on the artist but also on the group. Even if Aboriginal artists paint they have to obtain permission to use icons and symbols of other Aboriginal painters. "[My mother] showed me her artworks and the icons she used," says Noongar artist Jo Stuurman . "I was given permission to use those icons in my artwork, which is very important in validating your artwork and giving it spiritual meaning." The Australia Council for the Arts supports Australia's arts through funding. It has a suite of five protocol guides that addresses moral, ethical and legal considerations when dealing with Indigenous arts. 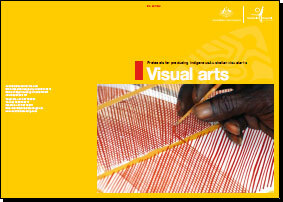 The five booklets cover media arts, music, performing arts, visual arts and writing, and are relevant to anyone working in or with the Indigenous arts sector - including artists, government, media, galleries and teachers. The protocol guides endorse Indigenous cultural and intellectual property rights that are also confirmed in the 2006 United Nations Declaration of the Rights of Indigenous Peoples. Each of the guides includes case studies of best practice and a checklist of key points for readers to consider. They are available for download at www.australiacouncil.gov.au. the role of galleries, dealers and collectors. An Aboriginal woman visits India. She comes across a skinny dread-headed man with an Indian guy carrying a didgeridoo . [Aboriginal woman asks:] "Hey mate where did you get that?" "Yep, I'm sure you did. Who taught you how to play it?" "Have you ever met any Aboriginal people?" [The skinny man enters the conversation.] "Yeah, we paint them and sell them in the street. We give lessons too. If you want to learn how to play one we'll be back there in an hour." "Well, sorry, no, I don't. And actually they are a men's instrument and women aren't supposed to play them. It's very disrespectful." "Oh believe me, yes it is, and I think I know." "Believe it or not I am actually Aboriginal, that's why. So you are painting them, selling them, giving lessons on them without any permission and knowledge or experience of Australian Aboriginal culture at all." "Well everyone else does it." "Right mate, yep that makes it okay." Disclaimer: Creative Spirits does not have the authority to give advice on genuine Aboriginal art. Articles found on this website are based on information gained and cited from material found in publicly published work such as the internet and newspapers.